Sorry for the delay today--our internet was on the fritz. Thankfully it all seems to be working now just in time to bring you today's "Monday" movie, Peter Pan, the 2003 live action version. This is probably my favorite film visitation of J.M. Barrie's classic tale of good versus evil, imagination, and growing up. The main character of the story is not the title character so much as Wendy Darling played by the very talented (and perfectly bright-eyed and boisterous) Rachel Hurd-Wood. Wendy also is revealed to be our narrator at some point. Jeremy Sumpter is extremely believable as Pan (perhaps the first time I felt the character could be real when watching an adaptation), and Ludivine Sagnier is also one of my favorite Tinker Bells ever--her spiteful coquettishness and feisty demeanor are spot-on. Jason Isaacs rounds off the principle cast in the role of a much darker Captain Hook. The principle characters. I felt the cast totally captured the essence of their roles. Because this story has been told to death by so many, I wanted to zoom in on the dynamics I felt were unique to this film, particularly the coming-of-age dilemma. Wendy is facing a crisis--grow up and lose her imagination to the demands of a strict Edwardian society, or attempt to remain a kid forever by staying in Neverland with Peter, who represents the wild spirit of childhood wonder that never grows up. She faces two obstacles: one, Captain Hook, the constant reminder of the tribulations of the adult world and two, her father Mr. Darling who has forced Wendy to abandon the nursery and end her girlhood. Wendy tries abandoning the promise of adulthood for the adventure of eternal youth with Peter. Captain Hook is a dark "father" himself, luring and manipulating Wendy into feeling she has respect and empathy when she is simply his pawn to destroy Pan. This correlates with the earlier plotline in which her own father forbids from exercising her child mind (of which Pan is the personification). And the director is not subtle at all about this father-daughter dynamic: He casts the same actor to play Hook and Mr. Darling. 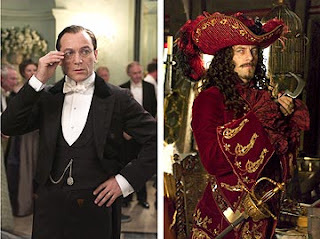 By casting Jason Isaacs as both Captain Hook and Mr. Darling, the director and his co-screenwriter (P.J. Hogan and Michael Goldenberg) really feed into this almost Freudian coming-of-age-dilemma. Not to mention taking Hook's character and turning him into a truly terrifying force of evil. This is the first time I felt the cruelty in his character. Jason Isaacs as both Wendy's father and the illustrious Captain James Hook. Wendy finds some relief at first playing house with Peter and the Lost Boys. But while they pretend to be mother and father, Wendy and Peter begin to recognize their own dreams of a future together and the possibility of being in love and having a real family one day. 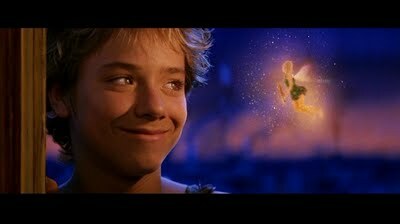 But Peter rejects the idea of growing up at all costs--even losing Wendy. When Wendy realizes that she wants to grow up and that Peter can not go with her, she becomes angry and winds up sympathizing with Captain Hook. Hook goads her on by inviting her to stay and tell stories to the crew, patronizing her work in a manner that no doubt is feeding her ambition to become a novelist (as stated in the beginning of the film). His efforts come off like courtship, which is why I said it gets a bit Freudian. In the end though, he is only promising her an adult world where she can expect pain and loneliness--a world with no imagination. 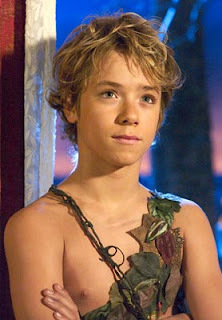 A world with no Peter Pan. Wendy realizes that she has to grow up, but if Peter is gone then her grown-up world will be without the eternal spark of childhood wonder--the sole thing that keeps us from being beaten into hardness and cruelty in adulthood (like Captain Hook). 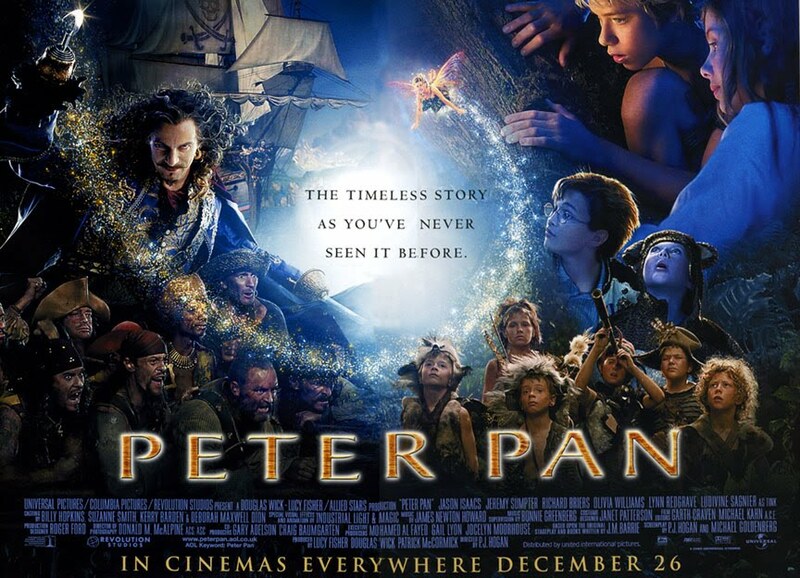 As representation of the ills of adulthood, Captain Hook attempts to bring Peter Pan and Wendy down by reminding them what will come of their futures. Wendy will leave Pan forever for a new person, "husband," and Pan will die of a broken heart--lonely, forgotten, unable to fulfill his love and join her in the grown-up world. But Wendy realizes she needs Pan even if she can't be with him forever, for what she must truly conquer is the dark part of adulthood that Hook symbolizes. When Hook is gone, Wendy can return to her life with the knowledge that Peter--the spirit of her youth--will never be threatened even by the trials of the grown-up world. And Wendy leaves Peter with the knowledge that he is loved by her forever--no one can live without love, even a boy who will never grow up. Wendy and Peter, always and forever. Nice blog on the movie. I must tell you, though, that Since the beginning, film production anyway, it's always been tradition to have the same actor play Captain Hook and Mr. Darling. The voice actors were the same in the Disney movie, and Cyril Richard played both parts in the broadway musical. It may or may not be Freudian. I did not know that. Thank you for the fyi!